After 4 years in the works, Sofia Rei and JC Maillard's duo album "Keter" will be finally released in January 2019. For a quarter of a century, John Zorn's Masada has been a consistently exciting and influential presence in the landscape of adventurous music, involving renowned artists such as Dave Douglas, Bill Frisell, Marc Ribot, Pat Metheny, John Medeski, Martin & Wood and many more. With this third and final songbook, The Book Beriah, he concludes the Masada series with 92 compositions over 11 albums, presented by some of the world's most accomplished musicians. In a unique project for voice and saz bass, longtime collaborators Sofia Rei and JC Maillard offer a superbly intimate and introspective study of the acclaimed source material. With lyrics by Rei and arrangements by both musicians, the songs explore a variety of topics, from love and solitude, to the ghost of Frida Kahlo and a childhood under dictatorship in Argentina. A captivating duet of unprecedented synergy, Keter has been coined "a standout addition to the Masada catalog". Sofia Rei is an award winning vocalist, songwriter and producer form Buenos Aires, Argentina and based in New York City. 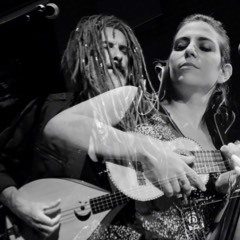 Her music explores connections between the various traditions of South American folklore, jazz, flamenco and electronic sounds. She has collaborated with artists such as John Zorn, Maria Schneider, Bobby McFerrin, the Klezmatics, Myra Melford, Pedrito Martinez, Lionel Loueke, Guillermo Klein and Geoffrey Keezer (with whom she has earned a Grammy Nomination for Best Latin Jazz Album of 2009). She is also a full time faculty member of The Clive Davis Institue at NYU-Tisch School of the Arts. Prior to "Keter" she has released four albums, several of which have won Independent Music Awards. Sofia's work has been featured on CNN, NPR's Tiny Desk, WNYC's Soundcheck, The New York Times and many more. She continues to set herself apart with a bold new vision in the global music scene. Jean-Christophe (JC) Maillard is a French composer, guitarist, pianist, electronic musician and arranger native of Pointe-à-Pître, Guadeloupe in the Caribbean. For the past 20 years, he has been touring, producing, arranging, acting as musical director and recording with all the great names in world music and world jazz. He has collaborated with Grammy wining artists such as Lisa Fischer, Angelique Kidjo, Richard Bona, Toure Kunda, etc. His project "Grand Baton", an innovative mix of rock and electronic music with Caribbean percussions has released two albums which received praiseful reviews from all over the world, establishing him as a daring creative mind in cross genre music. JC is also known for mastering and being the first player of the SazBass, a new 8-steel string instrument of Turkish origin.